Motorola Moto X Style review | What Hi-Fi? Motorola’s stylish new smartphone has plenty of tricks up its sleeve. You can customise the Moto X Style’s design to your heart’s content, making it personal to you. It also offers nifty software features and tweaks that overlay the Android OS, and make the user experience even better and smarter. That’s impressive in itself. As a big screen smartphone, the Moto X Style is also a fine device for watching videos and listening to music. This Motorola smartphone is called ‘Style’ for a reason: you can customise the Moto X Style using the Moto Maker website. Our review sample is a standard black affair, but you can go wild: change the soft back panel to a wood or leather finish, choose a black or white frame, and even alter the accent colours (such as the colour of the speaker grilles and the metal strip at the back). The only disappointment is that you don’t get a fingerprint sensor. It’s not a huge omission, but we’re starting to get used to seeing them on top-of-the-range devices. The Moto X Style has a bigger 5.7in screen this year (compared with last year’s 5.2in), but it’s not too much of a stretch to use in one hand. That’s due to the seriously slim bezels, which make it feel notably smaller than the likes of the 5.5in iPhone 6S Plus. Motorola claims it has the highest ‘screen to body ratio’, and we can believe that: there’s only just enough space for the front stereo speakers. It’s nice to hold too, thanks to its curved back and metallic flat sides. The rubber finish on the back panel also ensures a secure grip – it’s nowhere near as slippery as the Apple iPhone 6S Plus or Samsung Galaxy S6 Edge+. The chunky back makes it thicker and heavier than rival designs, but we like how sturdy it feels and how comfortably it sits in the palm of our hand. The textured power button and volume rocker are on the right, while the 3.5mm headphone plug and SIM tray are at the top. That Quad HD screen is just begging to have videos played on it, with the pixel-packing 2560 x 1440 resolution looking bright and crisp. The Motorola screen really shines with HD streams from Netflix or BBC iPlayer. The MasterChef kitchen looks clean and detailed, with edges sharply etched. The picture has a slightly warm presentation, but doesn’t look unnatural. Leafy vegetables and red meat look particularly appealing. The LCD display delivers deep, glossy blacks, with bright whites punching through the inky depths to give a strong contrast. Whites are much cleaner and punchier than on the Google Nexus 6P. You’ll see a more natural colour balance on the iPhone 6S Plus, along with greater subtlety which gives you a true impression of depth. Which you prefer is down to personal taste, but the Moto X Style’s approach favour richness. There’s still no support for high-resolution music, with Motorola sticking with CD-quality playback with MP3, WAV, AAC and FLAC files. That doesn’t mean the Moto X Style is a slouch in the audio department, though. Public Service Broadcasting’s Gagarin is a spirited listen. There’s drive and excitement throughout the song, with the medley of instruments blaring ahead with clarity and fine detail. They sound pretty solid, too. Voices may not be as richly nuanced as on the iPhone 6S Plus, and the rhythm could be tighter and more precise, but the Moto X Style is an enjoyable listen when paired with decent headphones. It’s a great deal more solid and cohesive than the Nexus 6P, and a touch cleaner and snappier than the Samsung Galaxy S6 Edge+. The front stereo speakers also deliver a loud, full-bodied performance, and though the presentation could be tighter and the top end hardens up a little when the volume is high, it projects a good and weighty spread of sound. The Moto X Style currently runs on Android 5.1.1 Lollipop, but there is a 6.0 Marshmallow update on the horizon. However, the Moto X Style comes almost as close to a pure version of Android as Google’s own. That’s because there’s zero bloatware. Motorola uses Google’s own apps for music, movie and photo playback, with only a handful of tweaks to enhance the experience. Moto Voice (Motorola’s own voice assistant) uses Google’s search engine to execute commands, while Attentive Display cleverly notices when you’re not looking at the screen to save the battery. It’s a nice alternative to Marshmallow’s Doze feature, which stops apps from sapping up battery life when the screen is turned off. There are also some nifty features such as flicking your wrist twice to quickly open the camera app, and Moto Display, where you wave your hand over the screen to peek at notifications. But the best part is that Motorola never forces you to use any of these features, instead it gives you the option to jazz up the Android experience. Our review sample fails to recognise “OK Google”, so Moto Voice is a handy alternative for voice commands. It understands our voice perfectly, although Apple’s Siri is slightly quicker. Keeping features trimmed means the Moto X Style is no slouch when it comes to the interface, giving you that buttery-smooth performance of a top-notch Android. Under the hood, there’s a Qualcomm Snapdragon 808 processor, with 3GB of RAM helping things run as smoothly as possible. Multi-tasking, playing games and opening apps are swiftly done, with barely a lag in sight. The Moto X Style packs a decent 3000mAh battery to handle its big-screen needs. It lasted eight-and-a-half hours in our standard battery drain test (a 720p video on loop at half brightness). While light users may be able to make it last until the end of the day, we find ourselves reaching for the charger in the afternoon. It doesn’t last as long as Samsung Galaxy S6 Edge+ or the Nexus 6P, but it does comes with a Turbo Power charger, which will take you from zero to 20 per cent in 10 minutes flat. Motorola claims its 21MP camera is one of the best in the business, promising better low light snaps, faster focus, faster capture and improved colour reproduction. You can also shoot videos in Ultra HD 4K. The front 5MP camera also has a trick up its sleeve: it has its own flash. It’s there to help minimise noise in low light conditions, which is sure to spruce up your selfies. For the most part, the Moto X Style’s camera works admirably. The shutter is near instantaneous, employing a ‘tap anywhere on screen’ policy to focus and take a picture in one go. You can drag the focus wheel around and adjust the exposure anyway you want, resulting in photos that are bright, sharply in focus and full of vibrant colour and not as overblown or warm-hued as pictures taken on a Google Nexus 6P. Whites, though, aren’t as clean and stark as photos taken on an iPhone 6S Plus, which also does a better job at conveying a sense of black depth. If you’re going to shoot HDR photos and 4K videos, you’ll want to make sure you have enough storage on board. The Moto X Style comes in 16, 32 and 64GB variants, but you can expand its storage up to 128GB thanks to a micro SD slot hidden in the SIM tray at the top. Considering many flagship smartphones are doing away with the micro SD slot, it’s sure to keep the Moto X Style popular with storage hunters. It’s also quite the bargain. 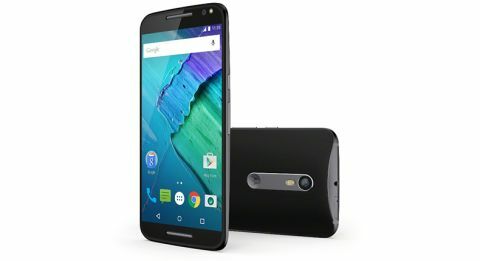 While the Google Nexus 6P holds the affordability crown amongst flagships, the Moto X Style isn’t far behind, with the 32GB model available for £400 or less online. That price will inevitably go up with storage options and choice of finishes, but considering the iPhone 6S Plus starts at £620, it’s a terrific big-screen deal. The Motorola Moto X Style is a pleasant surprise, its talented screen and enjoyable music performance making it more than just a style statement. This smartphone may not have the premium feel of the Samsung and Apple flagships, but we like how comfortable it feels to hold, how easy it is to use and how affordable it is compared with its rivals. Motorola’s enhancements to the Android operating system make the Moto X Style more fun to use than Google’s own Nexus 6P. And that’s high praise indeed. With custom designs, affordable price and exciting performance, we think this is a smartphone many will enjoy.